State Bank of India and Samsung India has announced the availability of Samsung Pay for higher variants of SBI Debit Card. With this collaboration, ~130 million SBI Debit Cardholders will be able to tap and pay using a wide range of Samsung smartphones at merchant outlets having Card acceptance machines. Samsung Pay works on 2.5 million Point of Sale (PoS) Card machines across the country through its revolutionary Magnetic Secure Transmission (MST) technology. Samsung Pay is currently available on a wide range of Samsung smartphones, enabling consumers to make offline payments without the need for a physical Card. The coming together of Samsung - the world’s biggest smartphones company and SBI - India’s biggest bank creates convenience for millions of consumers and provides a major boost to Government of India’s Digital India initiative. “Both Samsung and SBI are household names in India, and it is a momentous occasion for us to collaborate on Samsung Pay and extend an innovative solution that is transforming people’s lives worldwide. Samsung Pay, with its many ‘Make for India’ innovations, is revolutionising the way people carry out their day-to-day payments & transactions. To help more consumers avail of our innovative payment system, we have also introduced Samsung Pay to our mid-segment smartphones like Galaxy J7 Pro. We recently introduced Samsung Pay Mini to cater to the unique requirements of mid-segment consumers too,” Asim Warsi, Senior Vice President, Mobile Business, Samsung India, said. Samsung Pay, launched in India this year, has already received overwhelming response from consumers, who have instantly fallen in love with its Simple, Secure & Everywhere proposition. Samsung Pay comes with Samsung KNOX, Samsung’s defence-grade security system that is designed to keep consumers’ transactions safe. Samsung Pay will also be available on the newly-launched Samsung Galaxy J7 Pro smartphone, which comes with superior specs - 5.5” FHD sAMOLED display, 13MP + 13MP camera configurations and a stylish metal unibody design. The availability of Samsung Pay on Galaxy J7 Pro smartphone will increase its adoption as Galaxy J7 Pro is the most affordable smartphone in Samsung’s smartphone range with Samsung Pay functionality. Galaxy J series is India’s most popular smartphone series, accounting for one in four smartphones sold in the country. Galaxy J7 Pro is now available across retail channels at INR 20,900. Samsung Pay is also available on: Galaxy S8, Galaxy S8+, Galaxy S7 edge, Galaxy S7, Galaxy Note 5, Galaxy S6 edge+, Galaxy A5 (2016), Galaxy A7 (2016), Galaxy A5 (2017), Galaxy A7 (2017) and Galaxy A9 Pro. Samsung Pay consumers holding eligible SBI Debit Cards can avail a flat INR 100 cashback on minimum transaction amount of INR 500. The cardholder can avail maximum cashback of INR 500 per Card, during the offer period i.e., from August 01, 2017 till August 31, 2017. Samsung Pay is a complete payments platform. Apart from cards, Samsung Pay users can also make fast and secure UPI payments through P2P money transfers and also QR code scan and online payments wherever UPI payments are accepted. Consumers can add their SBI accounts and accounts of all banks which are on UPI to Samsung Pay. Samsung Pay also supports wallet payments - Paytm on Samsung Pay and Mobikwik and Paytm on Samsung Pay Mini, which is designed to cater to the unique requirements of Indian mid-segment consumers. Samsung Pay Mini provides a comprehensive platform for UPI and e-wallets. Samsung Pay will continue to build and bring to market other payment features going forward. 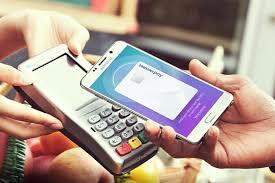 Samsung Pay works with Samsung’s patented MST technology as well as with Near Field Communication (NFC). MST replicates a card swipe by wirelessly transmitting magnetic waves from the supported Samsung device to a standard card reader. Through MST, Samsung Pay will work seamlessly on a majority of PoS terminals in India. Samsung Pay, fortified with three levels of security—fingerprint authentication, card tokenization and Samsung’s defence-grade mobile security platform Samsung KNOX—makes for an invulnerable payment service.